Whether you're an amateur or a professional, to most photographers a new digital SLR means a straight choice between Nikon and Canon. Enter the latter's latest beginner model in the Canon EOS 1200D, featuring the standard APS-C format sensor. It's priced at a very affordable £349.99 for the camera body, or a still trim £399.99 when bundled with the third-gen Canon EF 18-55mm f/3.5-5.6 zoom lens we had on test. Any attached lens is subject to a 1.6x magnification factor with Canon, thus we're provided with the 35mm equivalent of a 28-88mm focal range. Canon has also launched the 'EOS Companion app' to conincide with the new model, aimed at guiding DSLR beginners through their first DSLR. While the camera is clearly aimed at smartphone-savvy buyers, there's no Wi-Fi connectivity on-board - the app is purely for guidance, rather than linking up to the camera. The 1200D goes up against the entry-level Nikon D3300, with the Canon feeling less obviously shiny and plastic-y, its matte black body fashioned from a mix of glass fibre and polycarbonate resin. 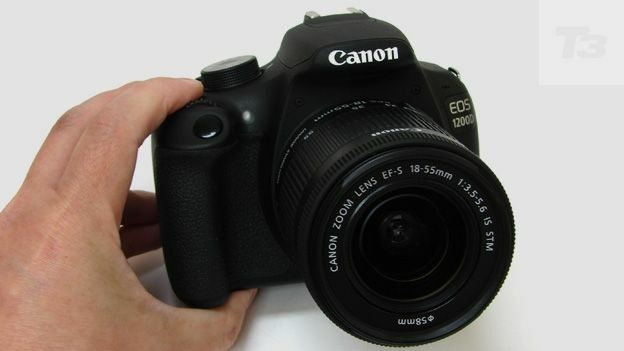 Indeed, despite being a starter model, this is a relatively serious proposition, which ups the resolution of its predecessor (the Canon 1100D) from 12 megapixels to 18MP. OK, so that's still not quite as high as the D3300's 24.2 megapixel resolution, but the Canon also offers a sturdy yet lightweight build, complete with eye-level optical viewfinder and fixed 3-inch LCD just beneath for composing our shots. It's a budget model that doesn't look cheap. It feels manageably lightweight in the hand, yet reassuringly solid with it. Inevitably some of the specification, including a maximum three frames per second capture speed, feels modest. The LCD screen is also fixed in place and cannot be swivelled to enable easier high or low angle shots, though it didn't stop us from getting some great pictures nonetheless. On this model there is also the ability to expand the core ISO light sensitivity range from ISO100-6400 to ISO12800 equivalent, for an almost see-in-the-dark performance. One perhaps surprising admission, however, is the lack of on-board wireless connectivity. Early press blurb slightly danced around this fact by making mention of an instructional app to accompany the camera - the EOS Companion app - a 'how to' guide downloadable to your phone or tablet. Anyone who has used a DSLR of any shape and size before will find much about the 1200D that's instantly familiar in terms of look, feel, hold and handling. The benefit of having a relatively compact DSLR, though the same manufacturer's EOS 100D is smaller still, is that even for those with smaller hands the Canon's chunky buttons and controls are readily within reach of forefinger and thumb. Indeed the shutter release button is set into place at the top of the handgrip at a comfortably sloped angle, with a ridged command wheel sitting just behind. The handgrip itself is sufficiently big enough to curl three adult-sized fingers around while your forefinger hovers over the shutter release and your thumb rests on an indented leather-effect rubber pad at the back. On a practical note, the eye relief for the optical viewfinder doesn't jut out that far from the body, meaning that every time we pressed our eye close to it, our nose inadvertently bumped up against the LCD directly below. Inevitably you'll be rubbing the screen free of smears and prints after a while. This being a beginner's DSLR, control layout on the rear plate falls between the busy-ness of a 'grown up' DSLR and the simplicity of snapshot camera. As regards the latter we get a familiar cross keys style arrangement of dedicated buttons with a central 'set' button to effect any changes. A dedicated button for ISO speed is always useful, with further buttons providing instant access to drive modes and self timer, white balance, menu, playback, and Live View mode, for either shooting video or checking detail when manually focusing. Naturally we are provided with a chocolate Rolo-sized shooting mode wheel, crammed with automatic and manual settings - a 'lucky' 13 in all. Encircling the base of this is a slider switch for turning the camera on or off with a thumb flick. As we say, there is a lot about the 1200D that feels familiar and 'just right', so it's not like there is a massive learning curve in store for anyone. Unlike models higher up the price scale the large 3-inch, 460,000-dot resolution screen on the Canon EOS 1200D's backplate is resolutely fixed in place, so cannot be angled up or down. Unless you've purposely placed the camera in Live View mode, to aid either manual focusing or to shoot video, said screen displays a menu of shooting settings ordinarily. This being a DSLR, however, we also have an eye-level viewfinder via which the lion's share of composition happens. This smaller yet sufficiently bright viewing window, with the camera's nine AF points highlighted, offers 95% frame coverage and a magnification factor of 0.80x. This contrasts with 100% frame coverage when using the LCD; so what we see is what we get. Whereas at one time the cheaper DSLR in any manufacturer's range involved investing in a quartet of AA batteries to slot into its handgrip, even this cheapest Canon offers a rechargeable lithium-ion battery off the bat, and a standalone LP-E10 charger to replenish it with. Turn the shooting mode dial to the video setting, press the dedicated rear plate Live View button and you're ready to shoot video on the 1200D via a squeeze of the shutter release button. Not quite the same instantaneous process as a mirror-less compact system camera then, but the mechanics of the DSLR are a little more rigid when it comes to doing something the format wasn't originally designed for. Naturally as with stills so it is with video capture: there's the choice of shooting with auto focus or manually re-adjusting each time you change the focal length or swap between subjects. The ability to shoot video where your subject is pin sharp and the background gradually defocused so as to draw the eye is a real boon when using the kit zoom supplied, as is the wide choice of additional Canon EF/EF-S lenses for the videographer. The capture rate here is just under 30fps - 29.97 fps according to Canon's blurb; obviously if you want 60fps or slow motion capture options look elsewhere. One concession at this budget price, however, is that sound is mono. In terms of stills the Canon is no slouch either, with colours veering toward the warm straight out of the camera. A 'kit' zoom this may be, but it's sharp from corner to corner and the lens' maximum aperture of f/3.5 is still sufficient to achieve the professional-looking shallow depth of field effects that we'd expect of a DSLR. This 18 megapixel EOS is a beginner's model that an expert wouldn't be ashamed to be seen with, or use. Yes, it's intuitive from the get go, so won't tax the uninitiated. At the same time it's easy to access manual settings and exert a bit of hands-on control over your shots rather than rely on the admittedly consistent 'auto everything' performance. In short you can quickly be up and shooting sharply detailed, colour rich images that require little if no work straight out of the camera. This is just what we want from an entry-level model.